On December 19, Friday, Manchester City goalkeeper Joe Hart added to his 8-year long stint with the club by signing a renewal contract that will see him at the Etihad stadium through till 2019. With this long-term commitment with Man City, he joins the likes of Vincent Kompany, Sergio Aguero, Edin Dzeko, David Silva, Samir Nasri and Aleksandar Kolarov. Hart said that there was never a doubt about him staying with the club, as he he just loved being around. He also commented on how the team was shaping up over the years and developing a winning mentality. He also stated that he was proud to be in one one of the most historic phases for the club and expressed his willingness to be with it for a long time around. The England goalkeeper has been instrumental in the transformation of Manchester City's fortunes under the Dubai ownership. Since his debut in 2008, the 27-year old Hart won two Premier League titles and a FA Cup and a Capital One Cup. The League title in 2012 was especially memorable as it broke a 44-year jinx with Man City having won the last title way back in 1968. A Shrewsbury trainee till 2006, Hart joined City in a 600,000-pound deal that year. His breakthrough came in the Premier League season of 2009-2010 when he was loaned to Birmingham City. He featured in the starting eleven of the Birmingham's record-breaking 12-match unbeaten run to the top division. Hart displayed outstanding judgement and reflexes and complete lack of fear. His return to Man City was inevitable. In 2010-11 he replaced Shay Givens as City's first choice goalie when they opened the season against Tottenham Hotspur. Not just that; he even earned himself a place in the English squad for the World Cup 2010 in South Africa. He was even England's lead goalie choice for the 2012 European Cup and 2014 Brazil World Cup. Doubts were cast about Hart's form of late, he being occasionally dropped by manager Manuel Pellegrini. But a tremendous show against Roma and Bayern Munich which helped Man City into the last 16 of Champions Cup, changed perceptions about the goalkeeper and influenced the club management's contract- renewal decision very positively. This Champions Cup season has been the best in recent times for City much in contrast to a very poor history in the tournament and they have Hart to partially thank for their recent improvement. The current season fetches him a 110,000-pound-a-week salary, which puts him next to Peter Cech but a place above Hugo Lloris in the EPL stakes. The City import of second choice goalie, 33-Argentine Willy Caballero from Spanish club Malaga this season may keep Hart on his toes. City sources say that the best way to maintain high performance standards is to have competition and Caballero's arrival is considered very important for Joe Hart. But for now, the No. 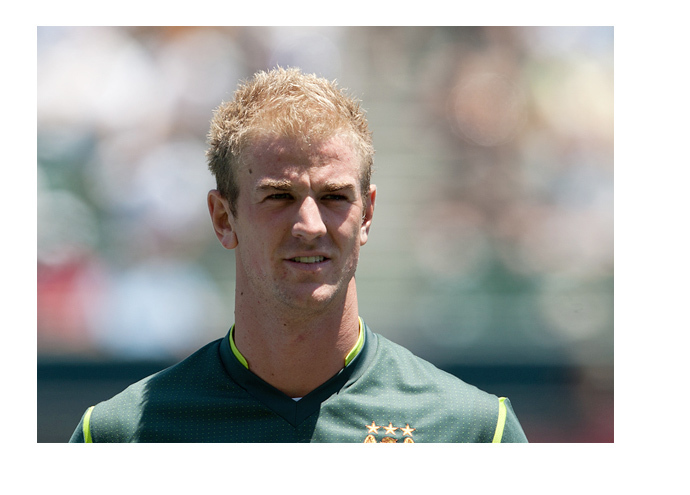 1 jersey for Manchester City is very much pinned onto Joe Hart's back.